The Smoking Gun makes your kitchen and bar creations appealing and unique. There are virtually no other methods that allow you to make such big flavor and aroma differences so easily. The Smoking Gun offers an alternative to traditional smoking methods. Today turning even salads, chocolate, meringue, sauces, butters and fruit into unique new culinary sensations is possible by adding a measured amount of natural, cool smoke. 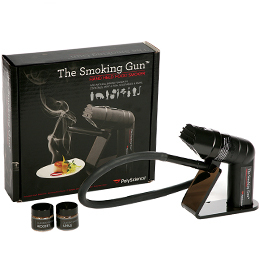 The Smoking Gun makes adding flavors and adjusting their intensities easy. Your selection of combustibles including various types of wood chips, teas, herbs, spices and even hay and dried flowers is limited only by your imagination. 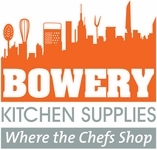 The durable, hand-held Smoking Gun operates on just four AA batteries allowing you to experiment and create signature culinary creations at extremely low cost per serving. Simply fill the Smoking Gun chamber with your choice of combustible, turn it on, light with a match or lighter and apply the smoke where you want it.